UK supermarket chain Iceland has seen its Christmas advert blocked from TV screens for being too political, but the Greenpeace-made cartoon is finding new life as a viral success online. The animated short film highlights destruction of the rainforest caused by palm oil production, and its devastating impact on the critically endangered orangutan. The commercial, voiced by actress Emma Thompson features a cartoon orangutan and ends with the words: "Dedicated to the 25 orangutans we lose every day". Iceland tells viewers that it is removing palm oil from all its own-label food by the end of the year. Clearcast, the body which approves or rejects adverts for broadcast on television and video on demand, said it was “concerned” that the commercial “doesn’t comply” with legislation on political advertising. 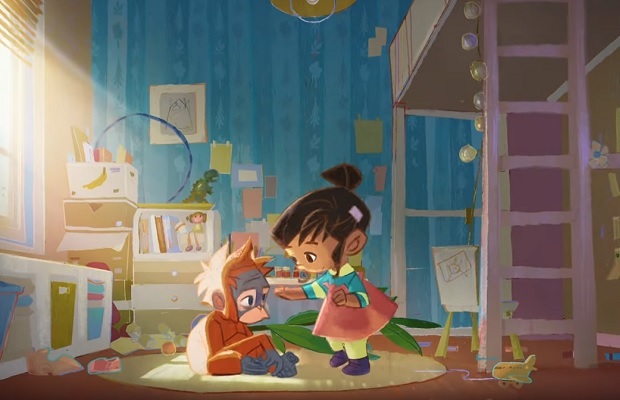 Iceland had wanted to make the Emma Thompson-voiced film, Rang-tan, central to its festive marketing campaign to raise awareness among shoppers. Under this code an advert is deemed to contravene the bar on political advertising if it is "inserted by or on behalf of a body whose objects are wholly or mainly of a political nature" or is "directed towards a political end". Iceland's managing director Richard Walker said: "Throughout 2018 we have led the retail industry to take action in areas such as rainforest destruction for palm oil and plastic pollution of our oceans. "This year we were keen to do something different with our much anticipated Christmas advert. The culmination of our palm oil project is offering our customers the choice of an orangutan friendly Christmas, and we wanted to reflect this in our advertising." He added: "Whilst our advert sadly never made it to TV screens, we are hopeful that consumers will take to social media to view the film, which raises awareness of an important global issue." However, the ban is bringing the ad extra publicity via the news, social networks and other earned media. Since launching this morning, the video has already picked up 130,000 views on YouTube. Iceland also posted the video the Twitter, where it has become a top trending top in the UK alongside the hashtag #palmoil. It has since received thousands of shares on social media, which is not regulated in the same way. The company tweeted: “You won’t see our Christmas advert on TV this year, because it was banned. But we want to share Rang-tan’s story with you." Greenpeace said the commercial was not originally intended for television, but neither they or Clearcast were able to immediately confirm whether it had been previously submitted for broadcast clearance.